This morning in Huntington at 6:50AM it’s currently 56 degrees under overcast skies. Winds are west at 0-3mph. Relative humidity is 98%, dewpoint 55, barometric pressure 30.14” and rising. Yesterday’s high was 69, and the overnight low was 54. Surface high pressure moving eastward across New York and New England will bring pleasant and dry weather to the region today and tonight. Warmer and more humid weather will return for the weekend as high pressure shifts east of the region and a south to southwest airflow develops. This morning’s fog should burn off to sunny skies today with highs in the lower 70s and light and variable winds. Tonight should be clear with lows in the mid 50s and light and variable winds. Saturday should be partly sunny with highs in the upper 70s and south winds 10 to 15 mph. The next weather maker will begin to move in Saturday night bringing mostly cloudy skies with a 40% chance of showers late over northern New York and Vermont. Lows will be in the mid 60s with south winds around 10 mph. A shortwave trough and associated cold front will move in Sunday providing sufficient energy to trigger showers and thunderstorms in the afternoon as diurnal heating goes to work on the warm and juicy airmass. Some thunderstorms may produce heavy rainfall. Highs will be in the upper 70s with south winds around 10 mph. Chance of rain is 70%. Sunday night showers and thunderstorms are likely. Lows will be in the mid 60s. Chance of rain is 70%. At this point, Monday’s looking partly sunny with a 50% of afternoon showers. Temps should be in the upper 70s to low 80s. Last year on this date we had a high of 79 and a low of 60. We picked up 0.19″ of rain. The record high was 92°F in 1953. The record low was 41°F in 1941. The Moon is a waxing crescent, 3d 20h old with 13% illumination. 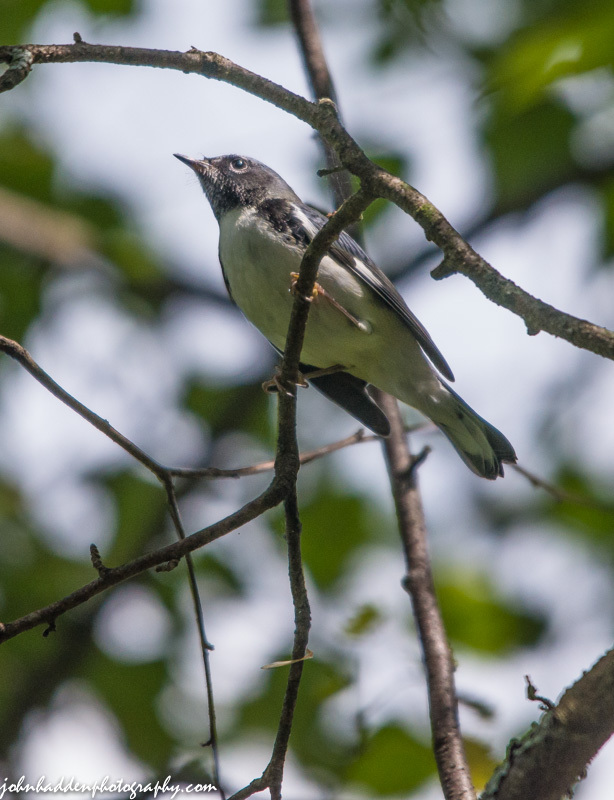 I was working in my “front office” when this little black-throated blue warbler appeared in the birch tree next to the porch. He was nice enough to give me time to grab my camera and telephoto lens. Nikon D600, Sigma 120-40mm lens @ 400mm, ISO 1250, f/5.6, 1/400″ exposure. This morning in Huntington at 6:50AM it’s currently 57 degrees under overcast skies. Winds are calm. Relative humidity is 99%, dewpoint 57, barometric pressure 29.88”. Yesterday’s high was 84, and the overnight low was 55. Surface high pressure will build eastward from the Great Lakes today, and the northwest winds will usher in a cooler and drier air mass which will persist through Friday. We’ll see partly sunny skies today with highs around 70 and northwest winds 10 to 15 mph. Tonight should be mostly clear with lows in the upper 40s and northwest winds 10 to 15 mph until midnight, becoming light and variable. Friday should be sunny and cooler with highs in the lower 70s and light and variable winds. Friday night should be mostly clear with lows in the mid 50s and south winds around 10 mph. The high will pass into the Gulf of Maine on Saturday putting us into a southerly airflow with increasing temperatures and higher humidity. We’ll see partly sunny skies with highs in the upper 70s and south winds 10 to 15 mph. Saturday night should be mostly cloudy with a 50% chance of showers as a cold front and associated upper level trough approaches. Lows will be in the lower 60s. Sunday’s looking showery at this point. Last year on this date we had a high of 82 and a low of 61. We picked up 0.02″ of rain. The record high was 94°F in 1952. The record low was 39°F in 1925. The Moon is a waxing crescent, 2d 20h old with 8% illumination. Another flower from along the tracks down in Jonesville. 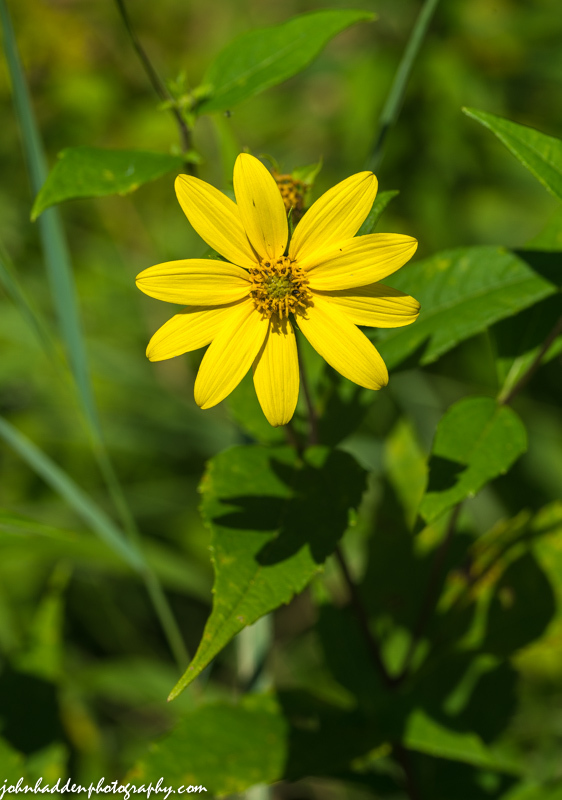 This woodland sunflower was bright and striking in the midday sun. Nikon D600, Sigma 105mm macro lens, ISO 80, f/9, 1/320″ exposure. This morning in Huntington at 6:50AM it’s currently a balmy 65 degrees under overcast skies. Winds are calm. Relative humidity is 98%, dewpoint 64, barometric pressure 29.92”. Yesterday’s high was 82, and the overnight low was 60. A weak cold front will move southeastward across the region today bringing a few scattered showers and thunderstorms. We’ll see partly sunny skies with a 20% chance of showers and a slight chance of thunderstorms this afternoon. Highs will be in the upper 70s with southwest winds around 10 mph, becoming northwesterly this afternoon. Tonight should be partly cloudy with lows in the mid 50s and northwest winds 10 to 15 mph. High pressure will build back in on Thursday bringing partly sunny skies and cooler temperatures with highs around 70 and northwest winds 10 to 15 mph. Thursday night should be mostly clear with lows in the upper 40s and northwest winds 10 to 15 mph. Last year on this date we had a high of 80 and a low of 64. We picked up 0.42″ of rain. The record high was 95°F in 1948. The record low was 40°F in 1969. Moon is a waxing crescent, 1d 20h old with 3% illumination. 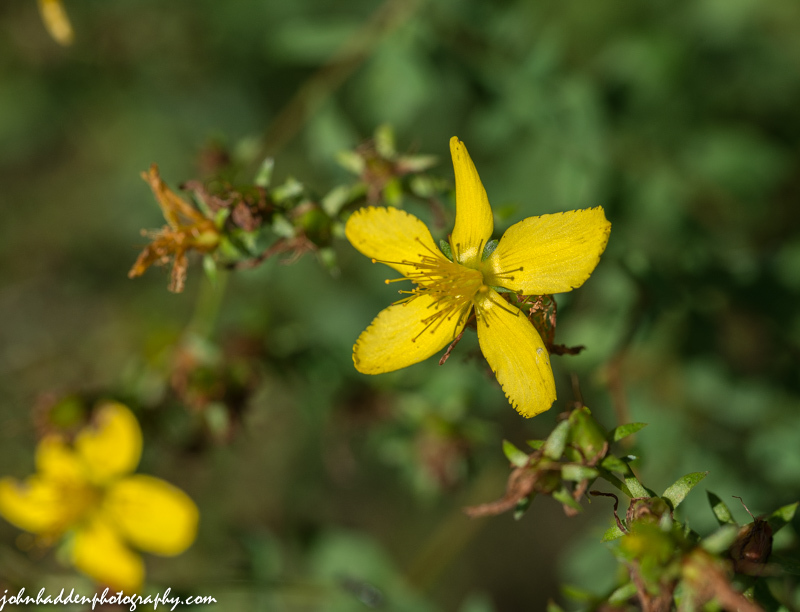 Common St. John’s-wort blooms bright in the mid-day sun along the railroad tracks in Jonesville. Nikon D600, Sigma 105mm lens, ISO 80, f/9, 1/400″ exposure. This morning in Huntington at 6:45AM it’s currently 56 degrees under clear skies. Winds are calm. Relative humidity is 99%, dewpoint 56, barometric pressure 30.12”. Yesterday’s high was 84, and the overnight low was 56. Departing high pressure will put us on into a southerly airflow today which will ratchet up the heat and humidity a bit more than yesterday. We’ll see sunny skies with highs in the mid 80s and light and variable winds, becoming southwesterly around 10 mph this afternoon. Tonight should be mostly clear until midnight, then become partly cloudy with a slight chance of showers and thunderstorms after midnight as a cold front approaches. Lows will be in the lower 60s with south winds around 10 mph. Chance of rain is 20%. Wednesday should be partly sunny with a 30% chance of showers in the morning, then a slight chance of showers and thunderstorms in the afternoon. Highs will be in the upper 70s with southwest winds around 10 mph, becoming westerly in the afternoon. Wednesday night should be partly cloudy with lows in the mid 50s and northwest winds around 10 mph. Thursday’s looking partly sunny and cooler with highs in the upper 60s and northwest winds 10 to 15 mph and gusting up to 25 mph. Thursday night should be partly cloudy with lows in the upper 40s. Last year on this date we had a high of 79 and a low of 59. We picked up 0.14″ of rain. Burlington norms for this date are highs of 78 and lows of 57. The record high was 96°F in 1948. The record low was 40°F in 1987. The Moon is a waxing crescent, 20 hours old with 1% illumination. 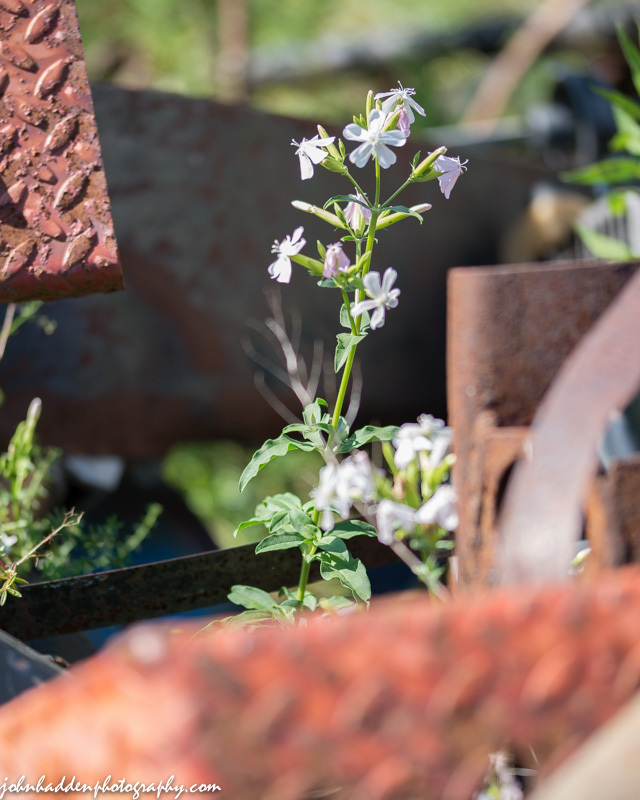 Nature shows her tenacity as Bouncing Bet (Soapwort) blooms up between chunks of rusting metal parts along the railroad tracks in Jonesville yesterday. Nikon D600, Sigma 105mm lens, ISO 80, f/3, 1/800″ exposure. This morning in Huntington at 6:45AM it’s currently 53 degrees under clear skies. Winds are calm. Relative humidity is 98%, dewpoint 53, barometric pressure 30.18” and rising. Yesterday’s high was 80, and the overnight low was 53. High pressure over the region this morning will dish up a few more fine late summer days. We’ll see sunny skies today with highs in the lower 80s and light and variable winds. Tonight should be clear with lows in the upper 50s and light and variable winds. Tuesday should be sunny with highs in the mid 80s and light and variable winds, becoming southwesterly around 10 mph in the afternoon. Tuesday night should be mostly clear and a tad muggy with lows in the mid 60s with southwest winds around 10 mph. Wednesday should start out partly sunny with a chance of showers late in the day as a cold front approaches. Highs will be in the upper 70s with west winds around 10 mph. Chance of rain is 30%. Wednesday night should be partly cloudy with lows in the mid 50s. Last year on this date we had a high of 76 and a low of 45. The record high was 97°F in 1947. The record low was 39°F in 1942. The Moon is new, 29d 12h old with 0% illumination. 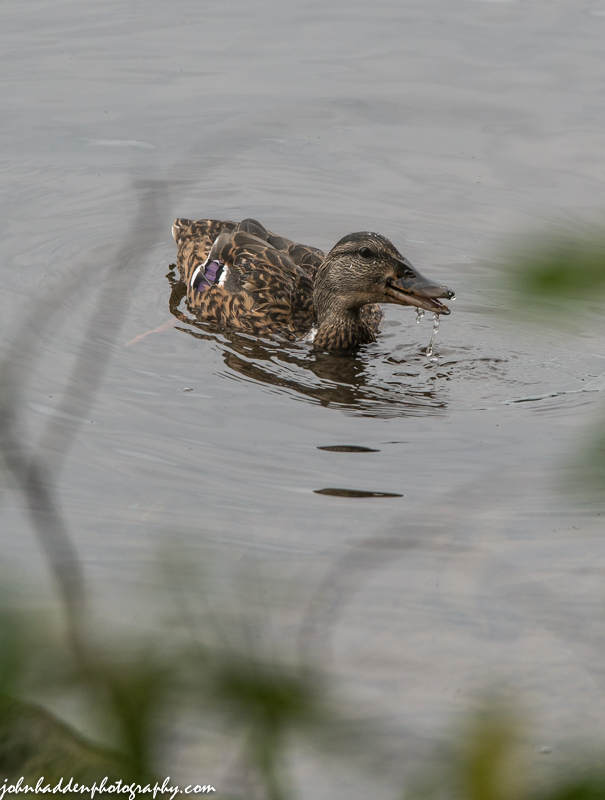 This young male mallard was the compliment to the napping female I posted the other day. 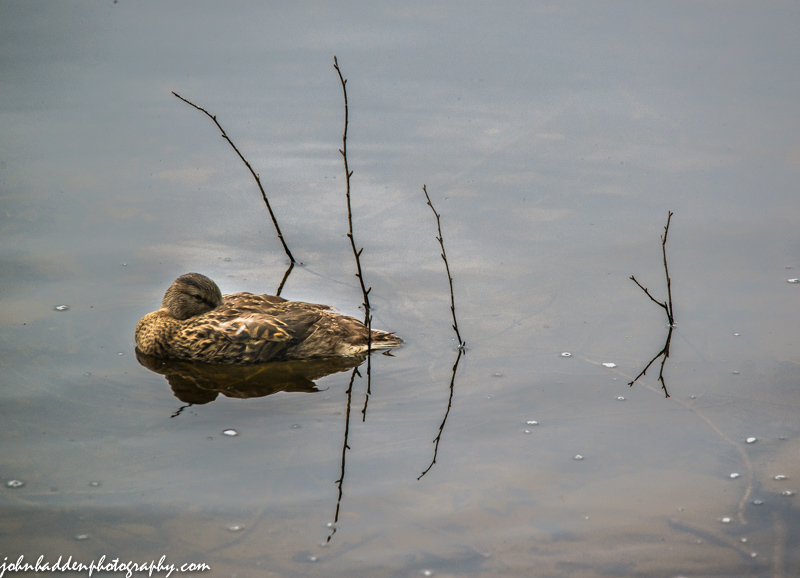 He was bobbing in the water near her while she snoozed. Nikon D600, Sigma 120-400mm lens @ 400mm, IS0 800, f/9, 1/800″ exposure. This morning in Huntington at 7:55AM it’s currently 59 degrees under overcast skies. Winds are calm. Relative humidity is 99%, dewpoint 59, barometric pressure 30.14” and rising. We picked up 0.03” of rain in the past 24hrs. Yesterday’s high was 64, and the overnight low was 58. A developing area of high pressure across eastern Canada will slowly move toward northern Vermont today. This will result in increasing amounts of sunshine and temperatures warming well into the 70s. We’ll see partly sunny skies. today with a slight 20% chance of showers this afternoon east of the Green Mountains. Highs will be in the mid 70s with light and variable winds, becoming northerly around 10 mph this afternoon. Tonight should be partly cloudy with a slight chance of showers until midnight east of the Greens, then mostly clear after midnight. Lows will be in the mid 50s with light and variable winds. Chance of rain east is 20%. Sunday should be mostly sunny with highs around 80 and light and variable winds, becoming northerly around 10 mph in the afternoon. Sunday night should be mostly clear with lows around 60 and light and variable winds. Monday’s looking mostly sunny with highs in the lower 80s and light and variable winds. Monday night should be mostly clear with lows in the lower 60s. Last year on this date we had a high of 70 and a low of 48. Burlington norms for this date are highs of 78 and lows of 58. The record high was 93°F in 1947. The record low was 43°F in 1988. The Moon is a waning crescent, 27d 14h old with 4% illumination. Nikon D600, Sigma 120-400mm lens @ 400mm, ISO 800, f/8, 1/800″ exposure. This morning in Huntington at 7:30AM it’s currently 61 degrees under overcast skies. Winds are out of the south at 2-4 mph. Relative humidity is 89%, dewpoint 57, barometric pressure 30.05″ and rising. We picked up 0.21″ of rain in the past 24hrs. Yesterday’s high 60, and the overnight low was 59. An upper level trough will move through the region today bringing a chance of showers during the day and early tonight. We’ll see cloudy skies with a 50% chance of showers. Highs will be in the upper 60s with light and variable winds, becoming southerly around 10 mph this afternoon. Tonight should be cloudy with a slight chance of showers until midnight. Lows will be in the mid 50s with light and variable winds. Chance of rain is 20%. A ridge of high pressure will drop down from Canada bringing partly sunny skies for Saturday. Highs will be in the mid 70s with light and variable winds. Saturday night should be clear with lows in the lower 50s and light and variable winds. Sunday’s looking sunny with highs around 80 and light and variable winds. Sunday night should be mostly clear with lows in the upper 50s. Last year on this date we had a high of 84 and a low of 59. We picked up 0.78″ of rain. The record high was 90°F in 1916. The record low was 39°F in 1982. The Moon a waning crescent, 26d 13h old with 8% illumination. A caught a shot of this very fat and healthy looking doe right over by our chicken/duck coop yesterday morning. 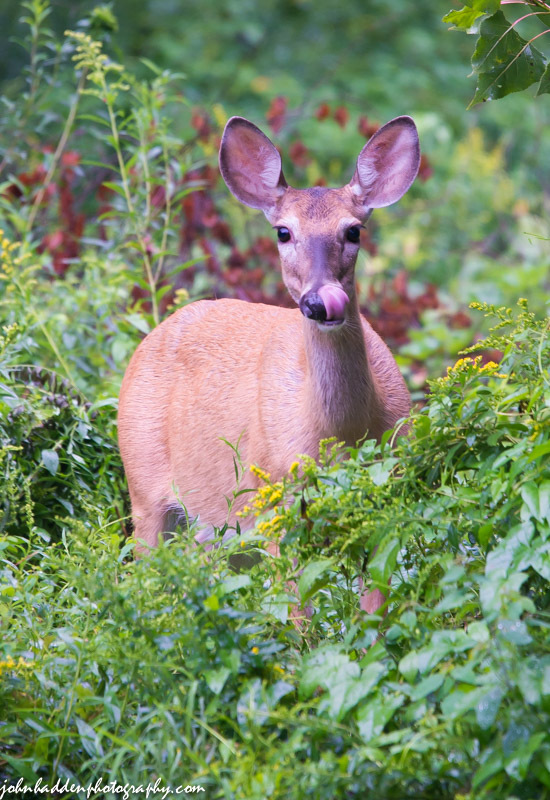 She was munching on corn cobs that we’d tossed in the tall grass. We have little doubt that she might be one of the ones responsible for recent vegetable garden pillaging that has left us bereft of fine crops beans, peppers and even tomatoes!